Woodhead Publishing / Elsevier Ltd. , U.K.
On March 11, 2011 the Fukushima nuclear power plant (NPP) in Japan was hit by an earthquake and subsequent tsunami which resulted in the release of significant amounts of radioactive material. 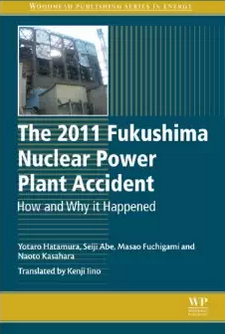 The book also records systematically the responses of central and local government, and evaluates the response of the plant owner - Tokyo Electric Power Company TEPCO. The incident triggered a world-wide concern about safety of nuclear power plants and led to the suspension of nuclear programmes by a number of countries. This book provides a sequence of events that eventually led to the disaster of level 7 event (the maximum of the classification) on the International Nuclear Event Scale. The failure occurred when the plant was hit by a tsunami triggered by an earthquake of the magnitude 9.0. The earthquake triggered a 13-to-15-metre high tsunami that arrived approximately 50 minutes later. The waves overtopped the plant's 10 meters isolation seawall, flooding the basements of the turbine buildings and disabling the emergency diesel generators. When the earthquake struck, units 1, 2 and 3 were operating, but units 4, 5 and 6 had been shut down for periodic inspection. Reactors 1, 2 and 3 immediately underwent an automatic shutdown called SCRAM. The plant started releasing substantial amounts of radioactivity on 12 March, becoming the largest nuclear disaster. In August 2013, it was felt that the massive amount of radioactive water is among the most pressing problems affecting the clean-up process, which may even take decades. As of 10 February 2014, some 300,000 people were evacuated from the area. The Fukushima Nuclear Accident Independent Investigation Commission found the nuclear disaster was "manmade" and that its direct causes were all foreseeable. Three authors of this book served on the inquiry committee set up by Japanese Government. Tokyo University professor emeritus Kiyoshi Kurokawa, mentions: "It was a profoundly a man-made disaster -- that could and should have been foreseen and prevented. And its effects could have been mitigated by a more effective human response. According to Japan's prime minister, Japan was unprepared for the disaster, and nuclear power plants should not have been built so close to the ocean in the first place. He acknowledged flaws in handling of the crisis by the authorities, including poor communication and coordination between nuclear regulators, utility officials and the government. He said the disaster "laid bare a host of an even bigger man-made vulnerabilities in Japan’s nuclear industry and regulation, from inadequate safety guidelines to crisis management, all of which need to be overhauled”. Therefore, all safety managers, designers and engineers of nuclear power plants, government agencies responsible for the regulation of the nuclear industry, and academics conducting research into nuclear plant design, operation and safety will find this book an essential informative guide to future planning.